The Major League Baseball Network is prepping for post-season action, including one TV spot that plays on the nostalgia of seasons past. 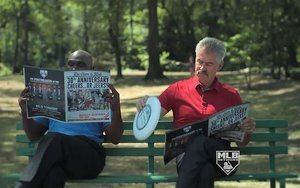 Creative content studio The Collective @ LAIR created the spot featuring former Major Leaguers Mookie Wilson and Bill Buckner. Entitled “Mookie and Buckner in ‘Catching Up,’” the spot marks the 30-year anniversary of the classic Game Six of the 1986 World Series, where Wilson hit a ground ball that slipped through Buckner's legs, sending the series to game seven. The spot, which debuted Sept. 14 on MLB Network, points to the memorable moments that happen each postseason and promotes MLB Network’s extensive studio coverage of the pennant races and the postseason. MLB Network will also exclusively televise two League Division Series games in October. In addition to MLB Network and MLB Network’s social media channels, the spot will be seen on Fox’s baseball coverage starting this Saturday, and in-stadium at Citi Field, the home of the New York Mets. Behind-the-scenes footage of the spot is also scheduled to run throughout MLB Network’s and MLB.com’s social media channels. MLB Network will roll out new spots dedicated to teams headed to this year’s postseason, and it will continue its regular-season campaign, “Closer To The Game,” which focuses on the Pennant Chase excitement and highlights how MLB Network’s on-air analysts provide comprehensive insight on its Emmy-winning signature show, “MLB Tonight.” MLB Network will also have new spots promoting its two exclusive National League Division Series telecasts.